This is our 7th Speedy Tuesday and we love the feedback we get from you! This week’s Speedmaster dates back to 1969 and it is a caliber 861 ‘Professional’ watch. It is a Speedmaster Professional 145.022 and while you can get one for a decent price and without too much hassle these days, this particular watch from one of our readers from the first hour has a nice story to it. His father bought an OMEGA watch in the 1960s at this authorized dealer called ‘Siebel‘. It must have been the mid-sixties according to the owner as he brought this watch to the store in 1969 for a service. There is no remembrance of the exact model and year, but it wasn’t a Speedmaster for sure. However, the people at Siebel lost this watch somewhere in the process of servicing or shipping. To properly solve this, the people at the store decided that he could pick a new watch from their collection. 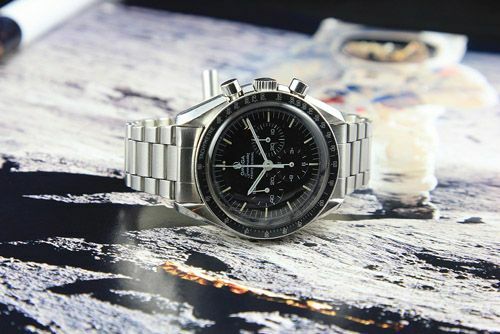 You guessed it right, he picked this OMEGA Speedmaster Professional 145.022. The father of its current owner wore this watch on a daily basis between 1969 and 1985. In 1985, he visited his brother (current owner’s uncle) who lives in the US, and sold it to him because he loved it so much. This was done for the symbolic amount of 5 Dutch Guilders (2 euro something). The uncle wore it for 17 years in the States and sold it back to his father in 2002. Also for 5 Guilders, which became a problem, as the Dutch Guilder was already replaced by the Euro. This meant that he went to the bank to get an original 5 Guilder note, just to keep the symbolism in place. At the end of 2002, his father moved from The Netherlands to Spain and wore this watch every single day till 2010. At this point he also bought a Rolex Submariner. During Christmas of 2011, his father visits him here in The Netherlands and gives him this family owned Speedmaster Professional, as he knew how crazy he is about these Speedies. You Asked Us – Oris Classic Date Or Save Up For an Omega De Ville Prestige? Neither!